This capable example of the semi-documentary crime film of the late 1940s, which comes complete with the usual voiceover narration, stars Dan Duryea as a gangster released from prison to help detective Howard Duff round up a drug-trafficking ring. 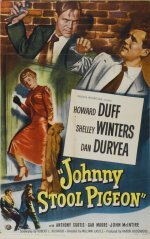 The story is overly contrived, but director William Castle extracts strong performances from his leads, who include Shelley Winters and John McIntire. Taking a prominent supporting role as a mute killer is a young contract player gaining valuable experience, Anthony (later Tony) Curtis.